Dogs barking excessively is one of the most common problems guardians ask for help with, and of course it’s something that can not only be annoying but cause all sorts of problems, some of which you may not even be aware of, like the impact it can have on your dog. A lot of our British breeds of dogs can be split into breeds that have a tendency to be more ‘barky’ than others, or should I say have a tendency to bark over and above what’s necessary. These would typically be your terriers, beagles and smaller breeds like the Lhasa Apso, Pekinese and toy poodles. At the other end of the scale you have breeds that are less likely to bark excessively or over and above what’s necessary. These might typically be your bigger breeds, Newfoundlands, Great Danes, Mastiff types and hounds. So, with this in mind, you are able to choose or at least have a better idea of what you’re likely to get in terms of barking behaviour when you select a particular breed. 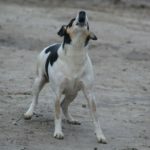 That being said, any dog of any breed can be prone to excessive barking in certain situations, if they are fearful, lonely, stressed or have simply developed the habit over time through any combination of events, so there is never any guarantee of whether you may end up with a ‘barky’ dog or not. With Romanian rescue dogs adopted in the UK, the majority are mixed breed so it’s more likely that even if they don’t look like a typical ‘barky’ breed of dog, they may have some mixed in. It’s also important to take into account their genetics, being mostly descendants from street dogs, even though they may never have been an actual street dog themselves, the Rommies can have a tendency to be alert barkers. In addition to this, again mostly due to hereditary traits, many Romanian dogs can be naturally cautious of anything new or out of the ordinary. This means they can be quicker to feel concerned or uncertain in situations than our British breeds meaning they can have a naturally lower threshold for barking behaviour. I don’t know therefore I want it to go away until I can decide whether it’s safe / not safe, going to hurt me / not going to hurt me, a problem / not a problem, which obviously means you can end up with quite a lot of barking. Another thing I’ve found quite common with Romanian dogs is barking ‘just in case’ or anticipation barking. They haven’t actually seen or heard anything yet, but they bark anyway because that particular environment, the garden, the window or a particular place on a walk, has previously presented triggers, especially if this is something that happens on a regular basis. They feel better being proactive about the situation and of course, this too quickly becomes a habit and you end up with a dog that is seemingly barking at nothing! 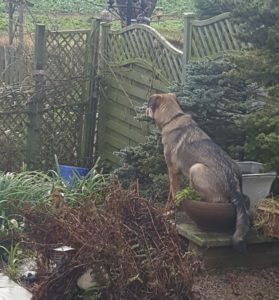 Romanian Rescue Dog Tramp ‘on watch’ in the garden! Another important point to note with the adopted Romanian dogs is that none of them arrive in this country at an age where we would normally socialise and habituate them to the kinds of things they’re going to encounter in a busy human centred environment. The earliest age you can get a puppy is usually around 5 months by the time they’ve had jabs etc, so your new arrival is now on the brink of adolescence and the socialisation and habituation window has all but closed. Add to this the fact that around the age of 6 months dogs can hit their first adolescent fear/sensitive period (and this is all dogs not just Romanian Rescue dogs) it can become easy to see how barking can become the behaviour of choice at such an unsettled period of their lives. During these sensitive/fear periods, dogs can become anxious or fearful about things that didn’t used to worry them before. 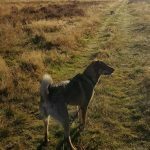 All dogs can struggle during these sensitive periods, but in my experience with Romanian dogs, again due to their genetic predisposition, they can be more deeply affected by things during this time. This means they can be more inclined to develop barking habits or reactive behaviours at this age which, if not supported appropriately, managed and sympathetically worked on, they can take with them as an ingrained behaviour into adulthood. So in this adoption scenario, you’ve only had your ‘puppy’ for a few weeks, they’ve had all the turmoil of their life up to that point, the journey from Romania, adjusting to a new home, family, environment and lifestyle and now they’re hitting a sensitive fear period, so barking is something that can very quickly become a habit, especially if it gets a result the dog wants. 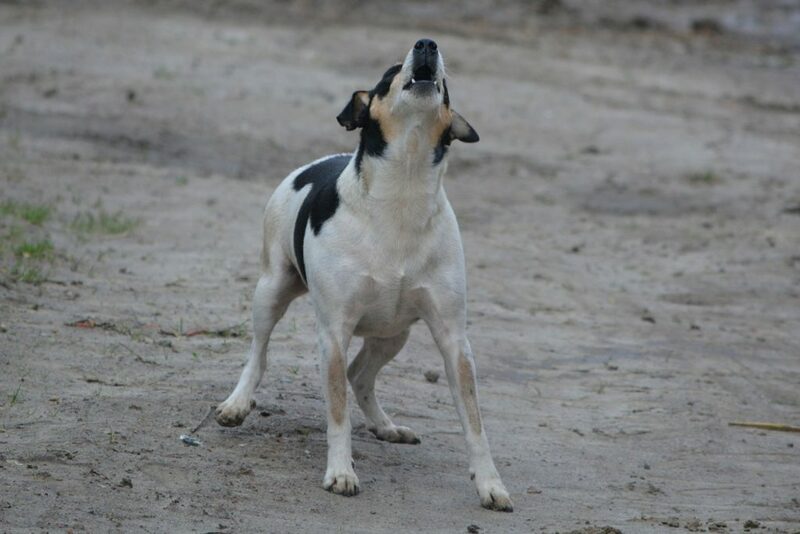 The key with any barking is to become aware of it quickly as a developing behaviour, start to manage it appropriately and deal with it as effectively as possible. Avoid shouting or telling your dog off, dragging them away or becoming aroused yourself. This just confirms to them that either the object/thing is scary because you’re joining in with them, or they perceive that the trigger is something that gets them told off and shouted at. This behaviour and negative energy from us can upset them and create anxiety which causes them to bark more in future to make the object or thing go away before you can get cross with them! Acknowledge that your dog alerted you to something, calmly let them know you’ve seen or heard what they’re barking at and reassure them. ‘It’s okay, yes I can hear it/see it, thank you I’m here to deal with it.’ In this instance, although ‘It’s okay’ is a form of reassurance, the application of it (and the way I create the association when I teach it) is not meant to be a reassurance in the way most people would apply it. It’s not meant to be repeated over and over in the way you would soothe a child, it’s intention is more matter of fact than that. It’s application in this instance is simply as a communication tool, so you’re able to let your dog know you have seen whatever they’re barking at, or you are aware of it and will deal with the problem rather than simply telling them to be quiet about it. Imagine if you went to stay in a cabin in a country where there were lots of bears roaming free, and a wild bear appears outside the window, so you shout and scream to let your partner or parents know it’s there, but all they do is tell you to be quiet? How does that help you learn to be ok about the bear? Surely it would be more successful in the long run, to help you get used to the bears and know they are not a threat, if your partner/parents acknowledged your concern and thanked you for letting them know that the bear is there, and then told you there’s no need for you to continue shouting about it, would that not help you calm down quicker? They could then also sit with you quietly at the window, and every time a bear appeared, explain to you how this bear is no threat and gave you a bowl of ice cream to eat while you sat and watched the bear go by. Obviously we can’t explain anything to our dogs in the form of ‘explanations’ with human words, and this is where counter conditioning comes in. 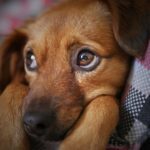 So, if the situation is appropriate and your dog can calm down, allow them time to watch and listen with you beside them for support providing counter conditioning techniques if necessary so they can learn to feel safe and confident in these situations. If your dog can’t calm down, you need to manage the situation and make time to do some controlled setups to help them. You may need to create some distance if the situation allows, move further back from the window or stay inside the doorway to the garden to help them be able to calm down and remain under threshold, but if you’re forever removing them from the situation completely or the situation is moving on, then they never actually get to learn that whatever it is they barked at is ok and that they can ‘stand down’. When you have an alert barker you have an alert barker, end of. They’re going to let you know when something’s there or when something’s concerning them, so eliminating barking completely is an unrealistic expectation, but what you can do at least, is minimise the intensity of it and the effect it has on your dog. So you may get an alert bark – woof woof woof but then your aim is to ‘bring them down’ quickly using counter conditioning and desensitisation techniques alongside teaching proactive alternative behaviours and redirection to keep your dog under their reactive threshold so they can remain in a learning zone productive to change. Obviously this is unlikely to be something that’s going to work instantly, so patience, consistency and repetition are key. It’s also worth remembering, that every time your dog gets into this state, they’re likely to be ‘stress stacking.’ or ‘trigger stacking’. So if it’s happening 5 or 6 times a day, you end up with a dog that has trouble truly relaxing and switching off, which not only means they’re likely to be more ‘barky’ because they’re living on a shorter fuse, but this can also affect their behaviour in other ways. Management is key with barky dogs. More barking practise = more barking = stronger behaviour, especially with things like barking at people/dogs/bikes going past windows, gardens and cars etc which are all self rewarding. The trigger comes along > your dog barks > the trigger leaves > your dog thinks barking worked. They don’t know the trigger was going to carry on past anyway they think they did it, so whoop whoop they got the trigger to go away! THIS very quickly becomes a strong behaviour and an ingrained habit, and that is what you need to stop from happening because that habit will become impossible to break. If you’re working hard to reduce barking but while you’re not present your dog is getting lots of practise, which behaviour do you think will remain the strongest? Management is your first port of call with barking behaviours. If you can’t deal with what’s happening in terms of teaching and counter conditioning work, then you need to manage it in the interim. Take your dog into the garden on a lead to prevent that rush of adrenaline when they first go outside and allow them to ‘come down’ before letting them off. Use enrichment games, find it, hide n seek treats, treat balls & Kong’s in the garden to prevent boredom barking & encourage alternative activities that keep their minds and paws happily busy. Work on teaching an alternative and incompatible redirection behaviour (taught and practised away from the trigger situation initially) – Go to a place, leave & let’s go or go find. Work on teaching an alternative & incompatible redirection behaviour (taught and practised away from the trigger situation initially) – Go to a place, leave & let’s go or go find. If you’re dealing with a dog that is reactive on walks to people or dogs, or your dog barks at strangers and visitors coming into your home then there could be elements of fear driving these behaviours, especially with Romanian dogs. You will need to enlist the assistance of a suitably qualified force free professional to help you handle this in the right way, certainly to begin with, or you could end up making matters worse. Dealing with excessive and unwanted barking takes quite a lot of focus, commitment, time and patience – which is why it’s so important to get on top of it quickly. Even just a few weeks of barking can lead to this behaviour becoming a habit and the longer it’s been happening the longer it will take you to turn it around. 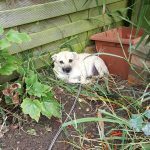 Begin to put strategies into place as quickly as possible and then work with whatever the situation is to minimise the intensity of it and keep your dog under their barking threshold. Break the situation down into chains of behaviour and work on each one individually, where does the behaviour start, what are your dogs particular triggers? 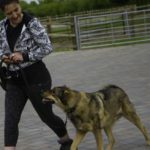 We have been chatting all about the topic of barking in our Members Group this week, the techniques you can use to help work on reducing the frequency and intensity of barking and helping your dog live an otherwise more relaxed lifestyle. 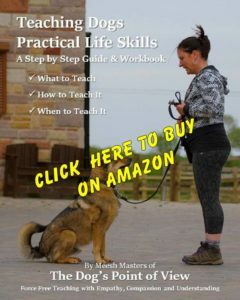 You can also find detailed teaching guides on the various life skills that will enable you to teach alternative and incompatible behaviours to your barky dog in my book Teaching Dogs Practical Life Skills – A Step by Step Guide & Workbook (these guides are provided free to subscribers in the Members Group). 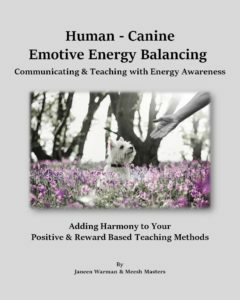 If you are interested in finding out more about deepening your relationship with your dog, dealing with behaviour chains and the impact your emotions can have on your dog and their behaviour, then Emotive Energy Balancing – Teaching & Communicating with Energy Awareness, a book I published more recently with Janeen Warman of Human Hound Healing, may be of interest to you.